Complete the form below to sign up for EAI membership. 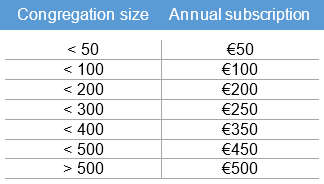 Congregation size determines subscription amount. EUR Enter the annual subscription amount from the chart above. Additional Voluntary Contributions may be processed through the DONATE page. * Privacy Disclaimer: The collection of these details is primarily so that we can register you as a member of EAI. This information will be stored in the EAI database and may be used by EAI for future promotion of events and activities. We will not share your information with any third parties.